Aaron was born and raised in Maine and has a deep appreciation for Mount Desert Island. He brings 17 years of local hospitality and management experience from working in Bar Harbor. During a winter long work trade in Maui, Aaron was introduced to a deeper understanding of oneself, communication and community. He is hoping to bring the lessons he learned in Maui back to Maine, and plant those seeds with Acadia Yurts. To Aaron, Acadia Yurts will not just be a retreat, but a thriving community. Karen has been very fortunate to travel a fair amount but says with absolute conviction, that regardless of where she's been, Maine feels like home. In Maine, she enjoys many outdoor activities in the beauty of Acadia National Park! For the past 4 years Karen has been teaching yoga on the beaches and mountain tops around Acadia and she feeds off the energy of sharing Acadia with outdoor enthusiasts like herself! Karen completed a Massage Therapy course thru Acadia School of Massage and she is excited to offer body work as an additional way to enjoy life. Her goal, through everything she's done in the past and will do in the future, is to give people an opportunity to realize their greatest potential and feel more empowered to do what makes them happy. 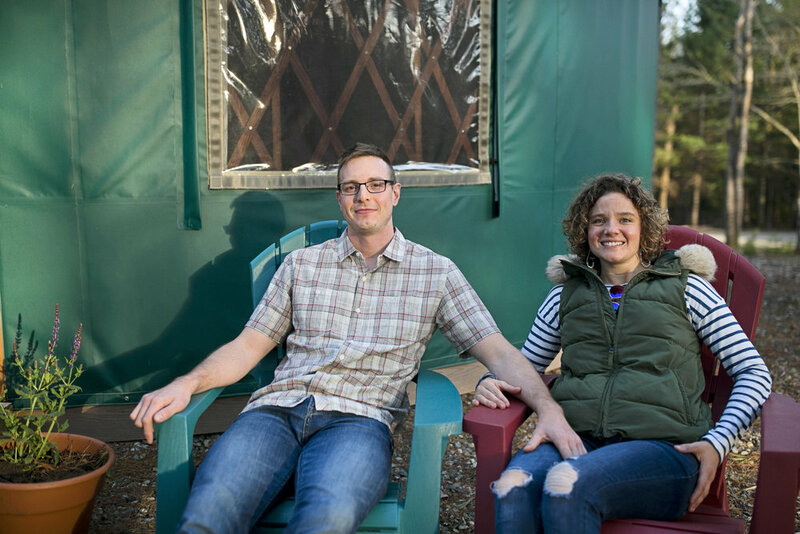 Aaron and Karen have both worked in the hospitality industry in Bar Harbor and through that, they've investigated why people return to Acadia year after year: universally, people come to slow down and reconnect. They want to connect to nature, their loved ones, and themselves. Acadia Yurts seeks to offer all the life enthusiasts a beautiful place to stay, that keeps them comfortably close to nature. Acadia Yurts plans to blossom grass roots style by adding more amenities in the coming years: additional yurts have been constructed, new Tiny House available 2019, community dining pavilion, a spa building featuring weekly yoga classes, massage, a floatation tank, sauna, vegetable and flower gardens, and much more! Karen and Aaron look forward to sharing their favorite place with like minded people! We look forward to sharing Acadia Yurts with you! We're excited to share Acadia Yurts with you!